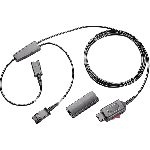 The Plantronics HW261N SupraPlus corded headset is a binaural (ie over both ears) noise cancelling, wideband headset. 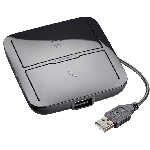 It is designed to be used with your desk phone, smart phone, or computer (each requires the right connector cable). 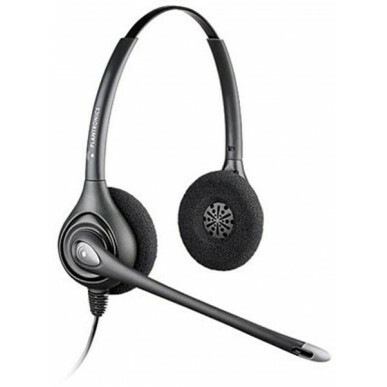 The HW261N is a HUGELY popular headset for call centres due to its brand recognition, low price point and durability. 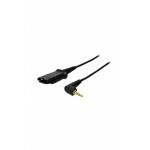 All corded headsets come with a brand specific QD (quick disconnect) connection and require an adapter cable to make them compatible with your phone. These range in price from $16 upwards. Many of these cables look the same but are different inside, so if you’re not 100% sure which you need, give us a call and our staff are happy to check for you. 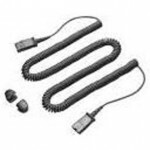 The Plantronics HW261N is a low cost, popular headset that has a comfortable and robust design. It’s not going to win any beauty pageants but it’ll do the job. 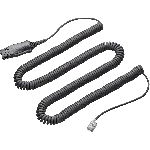 The noise cancelling microphone prevents most background noise from being heard by your caller. .
Headset manufacturers recommend that if you spend more than a couple of hours a day on the phone, you should spread the load with a duo headset. Of course if the office is noisy, a duo headset is a no-brainer – while the earcups themselves won’t block out all the noise, the mere fact that the sound feeds into both ears will help. The mic will pick up the user’s voice so they can also hear themselves talking. 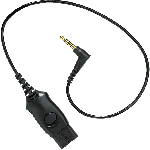 The microphone boom rotates so you can wear it with the boom and cable coming from either left or right ear. 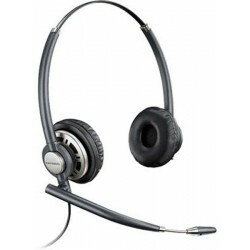 This is a wideband headset which means it offers the most natural sounding voice clarity but bear in mind that this is only if both you and the person calling you are on wideband phones, in which case it will just offer just standard narrowband.The HW261N has a two year manufacturer’s guarantee and Plantronics’ outstanding warranty service. 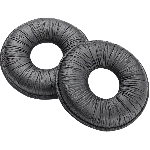 You can get replacement ear cushions for hygiene if staff move on or if they just wear out and you can even upgrade to ‘leatherette’ ones! (Top tip – grab a couple of these when you buy the headset so you don’t end up paying more for postage in a few months time.) 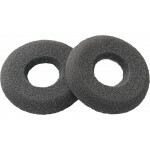 You can even purchase circumnaural' ear cushions to completely enclose the ears. 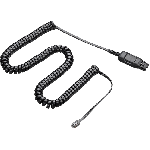 As with any corded headset, with the Plantronics HW261N you are connected to your phone via a cable, this can be frustrating when wires lie across your desk and get in the way of papers or drop down and get crushed & tangled under chair wheels. Binaural headsets don’t suit everyone. Receptionists that deal with the public look a bit unapproachable with a duo headset on and are better off with a mono headset. Staff that communicate with each other (for business purposes or just to chat) will likely feel the need to take the headset off to chat or at least move the earcups off their ear which can be annoying. That said if you have any kind of hearing loss or are on the phone all day (or it feels like all day) a binaural headset is a MUST. 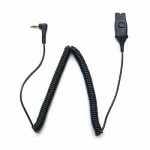 As we’ve mentioned, corded headsets need connector cables, so don’t forget to factor those additional costs when budgeting. You may even need an amplifier – if so, a wireless headset will probably work out cheaper than a corded one. 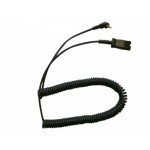 If you don’t have a headset port on your phone, a corded headset will take the place of your handset. If you still want the option of using the handset you can pick up a switch to allow you to swap between the two, but really, at that stage, you’ll probably want to pay a few bucks extra and get a wireless headset. A wireless headset will let you use the handset or headset, regardless of what sockets your phone has. 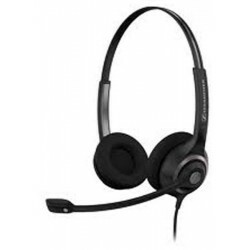 The Plantronics HW261N headset is a workhorse, call centre style headset, designed for the lack of care typically shown in this kind of workplace. As a duo headset it’s perfect for noisy offices or if you need to block out the world & concentrate. It’s a strong contender for those that don’t have a huge amount to spend but want the security and consistent quality of a well established and successful brand and the balance of a binaural headset. For better quality calls to reduce fatigue (and resultant sick leave! 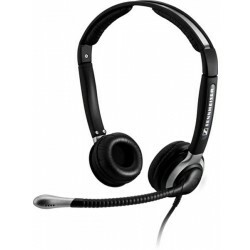 ), the robust Sennheiser SC 260 is the best headset at this price level and a great entry into their superior selection. If you’re looking for something with more executive styling, the Plantronics HW301N is a very smart & good quality option. If staff sit close together and it’s really noisy the ultra noise cancelling of the CC 520 IP is definitely worth the extra investment. 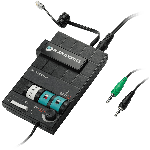 If you’re budget’s tight, the Axtel series are great value and you don’t pay big brand name prices, plus they have a ‘smart cable’ which addresses 95% of phone compatibility issues. 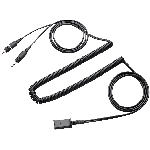 The Jabra range (the other big name in headsets) also offers a smart cable which will provide a compatibility solution for the majority of phones. 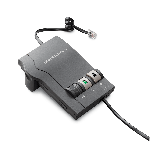 Have a look at the Jabra GN2000NCB for a robust, quality solution equivalent to the Plantronics HW261N or the GN2125 for something a little more dainty. Another factor to consider is the extra productivity that can be gained from the freedom to walk away from your desk while on a call. It is worth checking out the Jabra Pro 920 which is a great entry level wireless option for only a small amount extra (but it’s a single ear model). If you’re brand loyal to Plantronics, the CS520 is the wireless equivalent of the HW261N. Very happy with my new head set really good noise canceling as our office is very busy. It was so easy to set up, literally just plug it in and you're ready to go. It has great sound cancellation. Feels really comfortable easy to wear for 7 hours. The users are extremely happy with this item. I am impressed with the service provided by Simply Headsets and will concider future purshases. 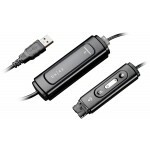 This product is ok - decent sound quality for the price and once we had the right cable ot was easy to set up. which works fine. It was very easy to set up and I didn't need to refer to the instructions. 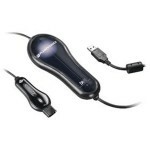 I love the quality and it being very easy to use. Makes life a breeze.The money was well spent. I couldn't have found a better headset from anywhere else. It's the best!! 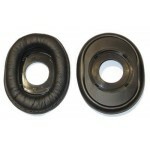 We have purchased both wideband and non wideband versions of these headsets. 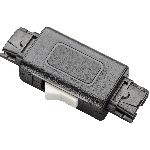 We would recommend the wideband version - they are the same cost anyway. 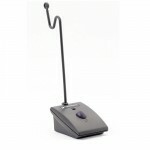 Used with NEC DT300-series handsets the HW261N provides a nice solution. 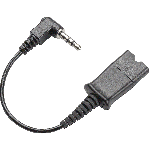 A10-16 A10 cable required for this combination. 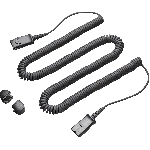 95% of phones work with this headset BUT all corded headsets require a connector cable to make them work. IF YOU DO NOT PURCHASE THE CORRECT CABLE THE HEADSET SIMPLY WILL NOT WORK. It's actually quite sensible - if you change your phones in the future you won't need to buy a whole new headset - just a new cable. The good news is we've done all the hard work for you! 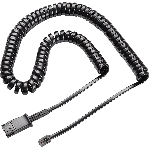 Just select your phone make and model below and you'll be directed to the right cable.